I can never be bothered making pizza dough so normally use pita bread or mountain bread as I like a thin crust. This comes from Hugh's Three Good Things. Heat oil in a large frying pan over a low heat. Add the garlic & cook gently for 30 seconds. Add the beans with 200ml of water & increase the heat. Simmer for a minute or two. Using a handheld blender blitz the beans to a puree & season. 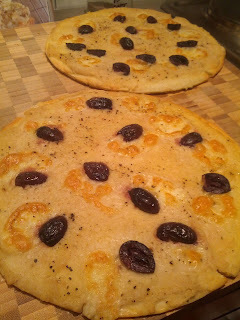 mozzarella & distribute over base followed by olives. Grind over pepper. Cook pizza in the oven for 10-12 minutes until crisp & golden brown at the edges. Enjoy!